The first weekend of the NCAA Tournament is greatest betting event of the year. Whether you like filling out a bracket, picking a national champion, predicting first-round upsets, or all of the above, MyBookie is the perfect home for your March Madness fun. Will Zion Williamson and his teammates cement their legacy at Duke with a title? Can Virginia get past its loss to a 16-seed last year? And can Kentucky get back to the Final Four? If you ... See More know the answers, or even if you don’t, MyBookie is the place to get in on the action. They have something for everyone – even you, multiple bracket guy. MyBookie has been in business for years. Their goal is to give you the best customer service in the business. And the best part is, they pay out fast when you win. I’m talking 48 hours. Bet with the best, then kick back and enjoy March Madness while you watch your picks cash! Deposit with MyBookie today with promo code Rotoviz for a 50% sign-up bonus. That’s promo code Rotoviz. With MyBookie, you play, you win, you get paid! Hi, rotoViz fans. Allow me a brief second to tell you about our good friends at the FFPC, the HOME of season-long, high stakes fantasy football. 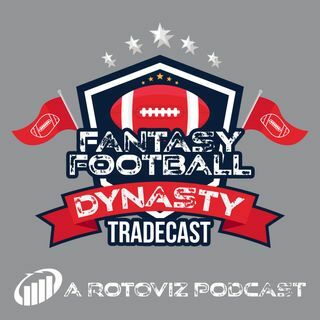 While it may be the off-season for most people, it definitely is not for our listeners or for the players over at the FFPC. If you’re a diehard who’s ready to draft now, the FFPC BEST-BALL leagues are already open for the 2019 season with drafts forming daily, starting at just a $35 entry fee. Are you a fan of the dynasty format? Over the last few years, the FFPC has become the go-to destination for serious dynasty players. They now have almost 300 active dynasty leagues starting at $77 and even have a $5,000-entry dynasty league! And the best part is – not a single dynasty league has folded in 9 years! Limited orphan teams are available for purchase right now and brand new start-up dynasty leagues will be opening shortly. Don’t miss the FFPC experience, rotoViz listeners. Go to MyFFPC.com and register now. That’s M-Y-F-F-P-C.com, the HOME of season long high stakes fantasy football.